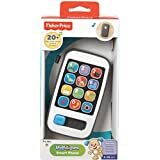 Here we will have a look at some of the best toddler phone toys with great look and available at low prices. Prices are lower in the sense that these are cheaper than most other phone toys and these are priced below GBP 15 or equal to GBP 15. 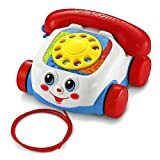 This is one of the most popular toy phones having a face expression and rolling eyes. Just pull the string attached to the phone and the eyes on the phone will move up and down. Its a very sturdy phone designed in old fashioned style with dialing numbers (in circular shape) and talking handle attached to it. It has four wheels and so it can easily move on the ground when pulled by the string attached. 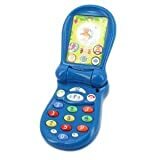 A really good phone to enhance communication skills of the toddler. Here is a nice video showing its function of rolling eyes. This toy is in the shape of a mobile phone and its twofold (flip-up). Once unfolded it opens up and on the base you will find several buttons or keys for the child to make an imaginary call and on the screen you will find pictures of characters from the UK television serial "In The Night Garden". So this toy is basically based on the theme of characters played in the UK television serial as mentioned above. Best thing about this phone is that it looks very cute with vibrant colors. Different keys on the phone perform different things. For example, just press the picture key and you will find characters like Upsy Daisy and Igglepiggle from the serial appearing on the pretend screen. Pressing the call key will make the toddler to hear one of the character's voice and so on. Different sounds are also produced when the phone is opened. 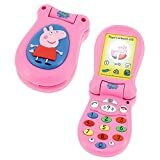 This is another theme based low priced flip-up toy mobile phone exactly like the one mentioned above but it has a theme based on Peppa Pig which is a children's television programme broadcasted on Channel 5 and Nick Jr. in the UK. This is really a good looking phone with vibrant colors and designed to learn numbers and colors. The keys on the phone do different things when operated and what each key produces is mentioned at the back of the purchasing box and these are known as the features of the phone. For example, just press the small black key on top-right and you can hear the laughing noises from various Peppa Pig characters and the characters are also displayed on the screen. Just watch this nice youtube video to know about more features of this wonderful toy. This phone has even lower prices than the other 3 phones mentioned above and it looks more robust in terms of design and functioning. It has more than 25 fun phone activities. But the downside is, it is not a flip-up phone but its just a single piece phone and it is also not a theme based phone. But this toy phone is best to learn counting. There is a particular key on the phone specifically meant for learning counting. Just press that key and a song will be played which will involve counting 1,2,3.... Etc. and by that a child can learn counting easily. Also each key is numbered as 1,2,3... Once each key is pressed the screen will show the number itself and also the number of items or living beings associated with that key number. For examples, when key number 5 is pressed the butterflies will start appearing one by one on the screen till they are counted 5. Here is a nice video to know about more features. This phone is the cheapest among all the toy phones mentioned above. But this is a very ordinary phone helping the child to learn counting and greetings from 20+ different songs. This is again not any theme based phone and also not a flip-up phone but definitely its low in price. But its body is quite thick and robust and so even if it falls on the ground from child's hand its not going to break. Each key on the phone produces different songs and depending on the position of the slide the keys can play songs or counts. The slide is at the bottom of the phone and this feature is only available in this toy. Just watch this youtube video for more. This phone is worth more than its price and it looks very beautiful. 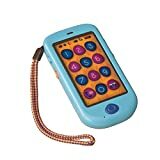 It is different from other toy phones (mentioned above) in the sense that it has touch screen facility available and it has some realistic features of a real world smart phone used by elders. The keys are numbered and each number is chanted when the key is simply touched. 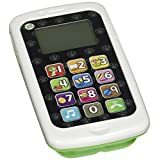 The song button on the side play four different songs and also the toddler can record his voice in the phone and listen to it at a later time. Also the phone has a closed string attached on top left corner to carry the phone even in fingers. Pre-recorded messages can also be heard on the phone and it can also take pretend pictures with some realistic sound. To know more watch this youtube video.